Your minimum startup supply kit, besides manicure chairs and tables should include working products, towels, a sanitizing system, various file types for acrylics, natural nails and buffing), nippers, cuticle pushers, tip cutters and brushes. Depending upon the specialty services you choose to offer, you may need to add some additional items to your nail salon supplies. Handy supplies for natural manicures and pedicures include a manicure bowl, a pedicure bath, soaking solution, lotions for sloughing and moisturizing, hand sanitizer, hot oil manicure system, toe separators, paper slippers, a pedicure cart ,a wide selection of polish shades, base coats, top coats, polish remover, cuticle remove, nail adhesive, and paraffin. According to the Nail Superstore, acrylic specialists need several items to create the artistic nail designs. They recommend 3D color acrylic nail powders, an acrylic nail tool, acrylic nail forms, acrylic nail brushes, liquids, powder and primer prep. If you are starting your own nail salon from scratch and need to provide everything for yourself, as opposed to pooling resources in an established salon, you will need all of the above plus some. As a startup business, plan on providing tables, lamps, chairs, a dedicated phone line, business cards, business license, a cash register and locked safe or cash box and a client contact list. Are you interested in opening your own nail salon? 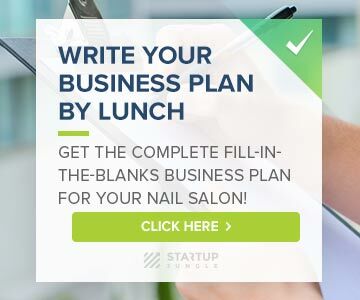 If you need ideas and tips, check out how to start a nail salon business.